Posted on July 12, 2018 - By Fucosoft | Follow YouTube, Twitter to Get More Information. Twitter is among the most popular social media platforms with over 300 million users per month. Users can send and read short messages known as Tweets like short texts, images, short videos, and GIFs. You can freely watch short videos and GIFs while glancing through Tweets. However, if you come across amazing videos or GIFs and wish to download them, you will be disappointed as the official Twitter app does not feature a download option. If this happen to you, take it easy, here this guide will show you 5 easy Twitter Video Downloaders to help you download Twitter videos and GIFs to Windows PC, Mac, iPhone, iPad or Android phones. For Windows and Mac users, it’s great to get a third-party Twitter video downloader tool. For example, Fucosoft Video Downloader, which allows you to download exciting videos or GIFs that you have seen on Twitter to your computer for offline viewing. This program also enables you to download videos from other video sharing sites like YouTube, Facebook, Instagram, Tumblr, Twitch, Vimeo, Break, Dailymotion, Hulu and more. Download and install the Fucosoft Twitter Video Downloader program on your computer and launch it. Find and copy the video URL from Twitter that you wish to download. Back to the program, click on “Download” and then “+ Paste URL”. In the pop-up window, choose your desired format and resolution, then click “Download” to save Twitter videos. Search on Google, you’ll easily find many free sites available to help you download Twitter videos on the desktop. Twitter Video Downloader is one of the easiest and hassle-free methods to download Twitter videos and GIFs directly to your computer without installing any software. Go to Twitter and find the Tweet that contains the video you wish to download. Get the link by clicking on the Tweet and copying the URL from the address bar of your browser. Go to Twittervideodownloader.com and paste the Tweet link in the input URL box, then click on the “Download” button. Some of the best and most used sites to download Twitter videos are: Twdownload, Saveting, Download-Twitter-video. Please feel free to check out these sites and find the one that works best for you. Google Chrome has a plethora of features and extensions to enable users effectively use browser. If you don’t want to use software or online tool, getting an extension like Twitter Media Downloader is great option. With this extension, you can easily download videos and GIFs directly from Twitter. All you have to do is clicking on the video and the extension will download the video. 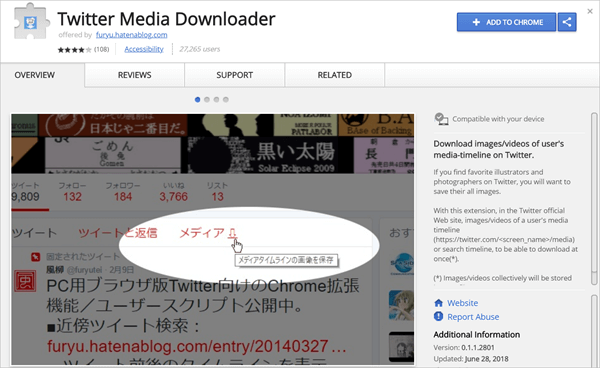 Go to Chrome Web Store and search “Twitter Media Downloader”, then click on “+ ADD TO CHROME” to install this extension on your Chrome. Every time you want to download a Twitter video or GIF, simply click on the extension at the right-hand corner of the search bar. Choose the video quality you want, then click on the “Download” button to start downloading and saving video to your computer. If you want to download videos from Twitter in your Android devices, you can try third-party apps, like Twitter Video Downloader. It is a simple to use video downloader application which allows Android users to easily download videos and GIFs directly from Twitter without any hassle. 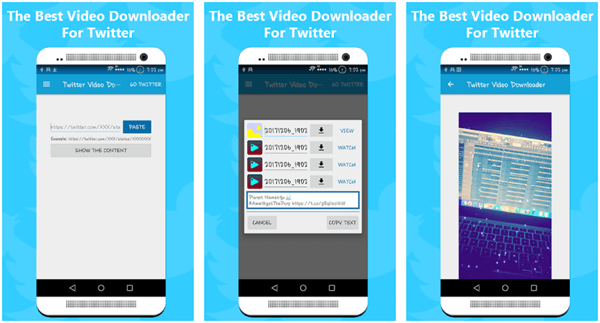 Download the Twitter Video Downloader application from Googly Play Store. Open the Twitter app and find the video or GIF you wish to download. Click on the video and select “Share”. In the “Share” menu, select “Twitter Video Downloader” option and the link for download will appear. 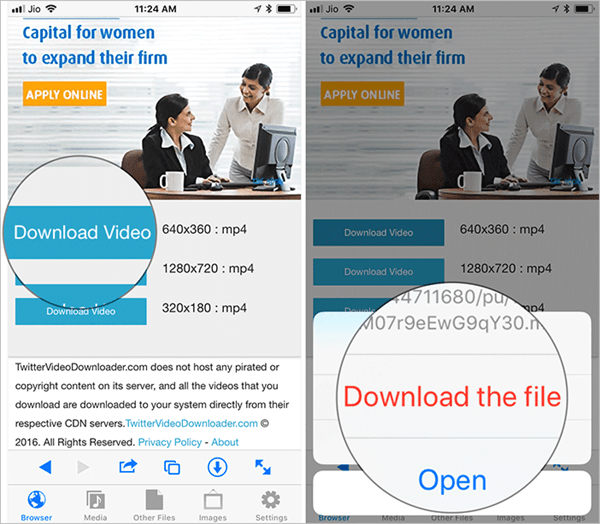 Now you can click on the “Download” button and then choose the format you want to download the video in. Downloading videos and GIFs from Twitter on Android is quite easy and does not require a lot of steps. However, this is not the case when it comes to downloading Twitter videos on an iPhone or iPad. There is no app to directly Twitter videos on an iOS device and the process is a bit lengthy. You should use file manager app like MyMedia to get the job done. Using it, you can download and save your favorite Twitter videos to iPhone or iPad Camera Roll. Go to your Twitter app and click on the “Share” button on the video that you want to download. Choose “Share Tweet via” and then tap “Copy Link to Tweet” in the iOS share sheet. Now open the MyMedia app on your iPhone and select the “Browser” tab. Then go to twittervideodownloader.com via MyMedia built-in web browser. Paste the link you copied from Twitter and tap on the “Download” button. Then choose the file size you want and tap on “Download Video”. Then choose “Download the File” to confirm. After that, give a name for the video file and tap “Save”. Here are 5 easy ways to download Twitter videos to your Windows PC, Mac, iPhone, iPad or Android phone. Depending on your device you can choose one that suits your needs and preferences. If you know any better methods to save your favorite Twitter videos and GIFs, please let us know in the comments below.